ONG CHOON MOY’s lung tumor has developed into the fourth stage when she hospitalized. The Multidisciplinary Team (MDT) of Modern Cancer Hospital Guangzhou quickly made her an individualized therapeutic plan: interventional therapy and cryotherapy. 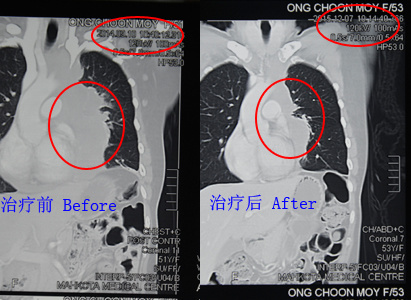 After taking interventional therapy and cryotherapy in Modern Cancer Hospital Guangzhou, her tumor shrank and the pain used to torture her greatly also disappeared. Wang Zenghai, ONG CHOON MOY’s attending doctor, told us that the CT result showed that ONG CHOON MOY’s lung cancer cells and those cancer cells metastasizes to the pleura reduced greatly.Her condition now turns better. Knowing that ONG CHOON MOY’s conditions become much better, her sister and mother started to support and believe the medical technology in China. ONG CHOON MOY mentioned that the medical technology in China is advanced than that in Malaysia. In Malaysia, there are only traditional treatments for lung cancer, such as chemotherapy, radiotherapy, etc. There is no cryotherapy, chemotherapy and other minimally invasive therapies in Malaysia. What’s more, the services in Modern Cancer Hospital Guangzhou are humanized; doctors and nurses here are friendly and nice. On ONG CHOON MOY’s birthday, doctors and nurses of Modern Cancer Hospital Guangzhou specially prepared ONG CHOON MOY a birthday cake for celebration. Although ONG CHOON MOY did not use to celebrate birthday, the considerate service of doctors and nursed made her happy and moved. One year pasts, ONG CHOON MOY’s mentality changed a lot. At the beginning, it was hard for her to accept the fact; she even wanted to give up, but now she becomes optimistic and strong. It is her optimistic and strong mind that helps her fights against cancer bravely. ONG CHOON MOY told us that her families are the first people she wants to say thank you, thank them for their support and care. For her family’s sake, she will try her best to restore to health. ONG CHOON MOY also shows her gratitude to those people who always help her, thank them for their support. What’s more, ONG CHOON MOY also gives some encouragement to other cancer patients:” No matter what kind of cancer you got, please be strong and confident. 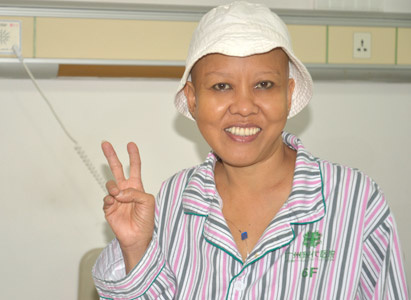 Treat cancer with normalcy, hold back the pain and defeat it.” Here, we wish ONG CHOON MOY a quick recovery.